Update: A homeless shelter has offered Jamal Speaks housing, and D.C. Public Schools said he can play for the Ballou football team again. Go here to see updates. 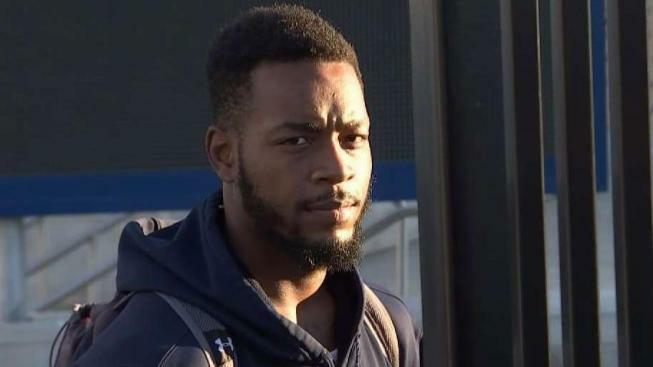 A homeless student in Washington, D.C., who has an offer to play college football was kicked off his high school football team because he doesn't have a permanent address. Jamal Speaks, a football player for the Ballou High School Knights, is being recruited by Temple University, the school confirmed in an email to NBC. The senior said Temple coaches attended a Ballou game on Saturday to see him in action. But before the 18-year-old stepped onto the field, Speaks said he was sidelined because of concerns with his residency status. "It's a heartbreak," Speaks told News4. "I can't even practice right now." D.C. Public Schools officials say the District of Columbia State Athletic Association determined that Speaks is eligible to play, but they say the District of Columbia Interscholastic Athletic Association ruled that he is ineligible because they could not verify his address. Speaks said his father is deceased and he doesn't have a relationship with his mother. With no family support, the teen sleeps on friends' couches. He said he faced a similar problem two years ago, but thought the issue had been resolved. "I already proved that I was a homeless resident," he said. According to The Washington Post, Ballou Principal Willie Jackson pulled Speaks from Saturday's game and threatened to fire the football coach if he let him play. "It was demeaning to the young man," said reporter Monet Anderson, who covers high school football games in the region for Top Sports. Ward 8 Council Member Trayon White wrote a letter to the school system in support of Speaks. "It’s incumbent upon me to get this boy support he needs to not only play football but to be successful in life and go to college," White said. Speaks says he just hopes to practice with teammates, graduate and attend Temple University. Asked if the DCIAA's decision will affect Speaks' eligibility to receive an athletic scholarship, a spokesman for Temple University Athletics told NBC, "Due to NCAA regulations concerning high school student athletes, we are not permitted to comment further."